Our Reflexite Rail Gate Arm Prismatic Retroreflective Tape is a Type V prismatic reflective tape. It is designed for rugged, outdoor use in rail and other gate arm conspicuity applications. 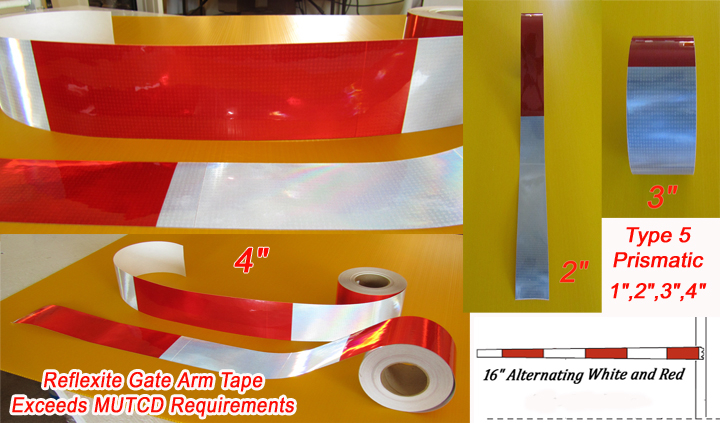 This tape exceeds the requirements of the US DOT FHWA Manual on Uniform Traffic Control Devices (MUTCD) - 2009 Edition per Section 8C.04 Paragraph 05 stating "Gate arms shall be fully retroreflectorized on both sides and shall have vertical stripes alternatively red and white at 16-inch intervals measured horizontally". Reflexite gate arm tape is prismatic meaning that it uses micro prisms to collect light and return it back to the source which is normally a cars headlights. This is an extremely bright tape and can be seen from well over a thousand feet away. We carry this tape in 1", 2", 3" and 4" widths. The RGA tape is rated for a 10 year outdoor life. Like all Reflexite tapes the RGA gate tape has a very aggressive adhesive and sticks well to any smooth, clean surface. You can make your choice using the drop down box above.